Shanghai, China — April 17, 2019 – SAP Concur®, the world’s leading provider of expense, travel and invoice management solutions, today announced an SAP Concur China Development Center in Shanghai, China. 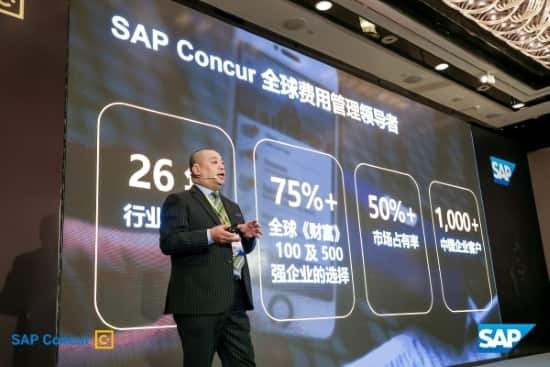 In line with SAP Concur's strategy to strengthen its commitment to China and provide local enterprises with a connected, customer-centric experience, the new China Development Center will develop and deliver end-to-end spend management solutions optimized for China's market requirements. “China is a growth market and a leader in mobile innovation with tremendous opportunities for SAP Concur. The investment in the China Development Center is aligned with our focus and commitment to continuously drive innovation and deliver completely connected spend management solutions tailored to local market requirements. We look forward to expanding our product and service offerings to better serve Chinese companies operating both locally and abroad, and help their businesses run at their best,” said Deepak Seth, Vice President of Mobile Product Management and Strategy, SAP Concur. The China Development Center builds upon SAP Concur’s existing commitment to the Chinese marketplace.It will strengthen SAP Concur solution capabilities in mobile, Fapiao, central billing and payments which will enhance customer experience in China. Learnings from mobile innovations in China will also benefit customers worldwide. The China Development Center is integrated with SAP Concur’s global development capabilities to deliver a seamless experience to all customers in China and globally. In addition, SAP Concur is working with both global and local partners to further expand its ecosystem and provide Chinese companies a simple way to connect and engage globally while having unmatched insights and visibility into their spending. SAP Concur has enhanced its integration with Ctrip Corporate Travel, China’s leading online travel agency, to improve the end-to-end travel user experience. The optimized solution will further simplify the travel booking and expense reporting process by streamlining pre-trip approval, booking, and expense management. “More and more companies in China are looking for ways to gain better visibility on their corporate spend and bring data from different sources into one view. SAP Concur is committed to helping companies implement intelligent spend management by integrating intelligent technologies, such as machine learning and advanced analytics, coupled with a broad ecosystem and network, to give customers access to a clear, unified view of their business spending with actionable insights. Following the establishment of the China Development Center, we are better positioned to collaborate with our partners to deliver best-in-class intelligent spend management solutions to support companies in China operated locally and globally,” said Jeff Lam, General Manager, Greater China, SAP Concur. For more than two decades, SAP Concur has taken companies of all sizes and stages beyond automation to a completely connected spend management solution encompassing travel, expense, invoice, compliance and risk. SAP Concur’s global expertise and industry-leading innovation keep its customers a step ahead with time-saving tools, leading-edge technology and connected data, in a dynamic ecosystem of diverse partners and applications. User-friendly and business-ready, SAP Concur unlocks powerful insights that help businesses reduce complexity and see spending clearly, so they can manage it proactively. Learn more at concur.com.hk or the SAP Concur blog.